As a specialist in the history of architecture and urbanism (M.A and Ph.D. Cornell University; B.A. University of Maryland) my work centers on architecture's relationship to culture, place, identity and memory. 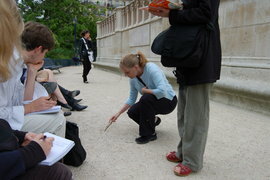 Ongoing teaching projects include development of courses for the Ithaca Core Curriculum on the architectural expression of racial, class and gender identities (Reading Buildings, Architecture and Gender), the study of pre-industrial "green" building principles (Architecture Across Cultures), and the incorporation of 3-D computer modeling in the study of Urban Design (Great Spaces). My scholarship focuses on architecture in France and Russia in the 18th and 19th centuries; recent publication projects explore the illustrated travel album as a medium of cultural exchange and translation of French texts documenting the 19th century transformation of Paris. Earlier work explored the theoretical writings of 19th century French architect Viollet-le-Duc and the architectural impacts of the French Revolution.